Martyrs of the Early Church who were beheaded during the reign of Diocletian; the date of their execution is given as 25 October, 285 or 286. It is stated that they were brothers, but the fact has not been positively proved. The legend relates that they were Romans of distinguished descent who went as missionaries of the Christian Faith to Gaul and chose Soissons as their field of labour. 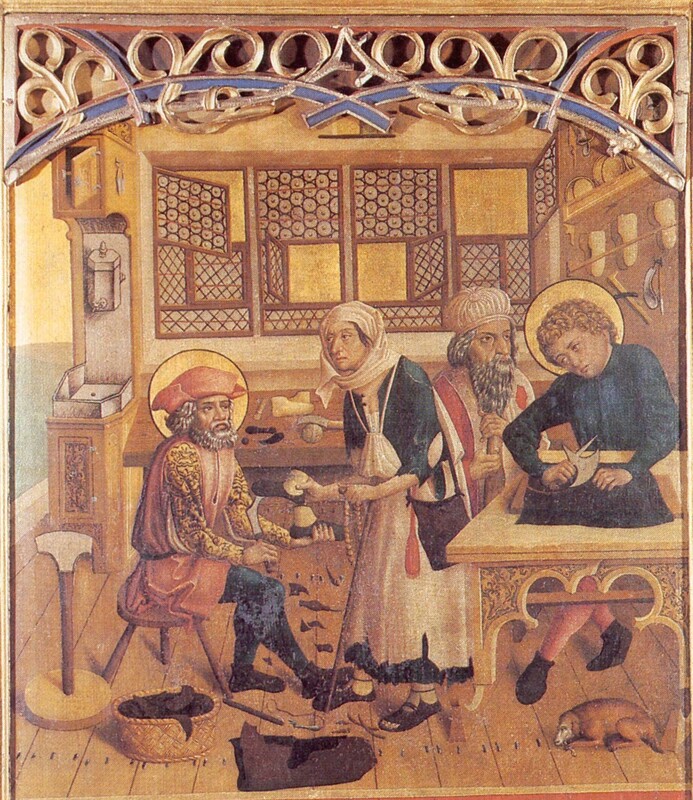 In imitation of St. Paul they worked with their hands, making shoes, and earned enough by their trade to support themselves and also to aid the poor. During the Diocletian persecution they were brought before Maximianus Herculius whom Diocletian had appointed co-emperor. At first Maximianus sought to turn them from their faith by alternate promises and threats. When Maximianus saw that his efforts were of no avail, he gave Crispin and Crispinian into the hands of the governor Rictiovarus (Rictius Varus), a most cruel persecutor of the Christians. Under the order of Rictiovarus they were stretched on the rack, thongs were cut from their flesh, and awls were driven under their finger-nails. A millstone was then fastened about the neck of each, and they were thrown into the Aisne, but they were able to swim to the opposite bank of the river. In the same manner they suffered no harm from a great fire in which Rictiovarus, in despair, sought death himself. Afterwards the two saints were beheaded at the command of Maximianus. 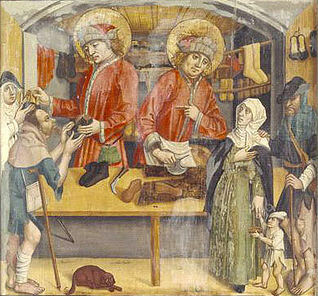 Saints Crispin and Crispinian from a c1500 altar panel at Dinkelsbühl, Bavaria. This is the story of the legend which the Bollandists have incorporated in their great collection; the same account is found in various breviaries. The narrative says that a large church was built over the graves of the two saints, consequently the legend could not have arisen until a later age; it contains, moreover, many details that have little probability or historical worth and seems to have been compiled from various fabulous sources. 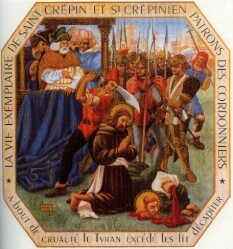 In the sixth century a stately basilica was erected at Soissons over the graves of these saints, and St. Eligius, a famous goldsmith, made a costly shrine for the head of St. Crispinian. Some of the relics of Crispin and Crispinian were carried to Rome and placed in the church of San Lorenzo in Panisperna. Other relics of the saints were given by Charlemagne to the cathedral, dedicated to Crispin and Crispinian, which he founded at Osnabrück. 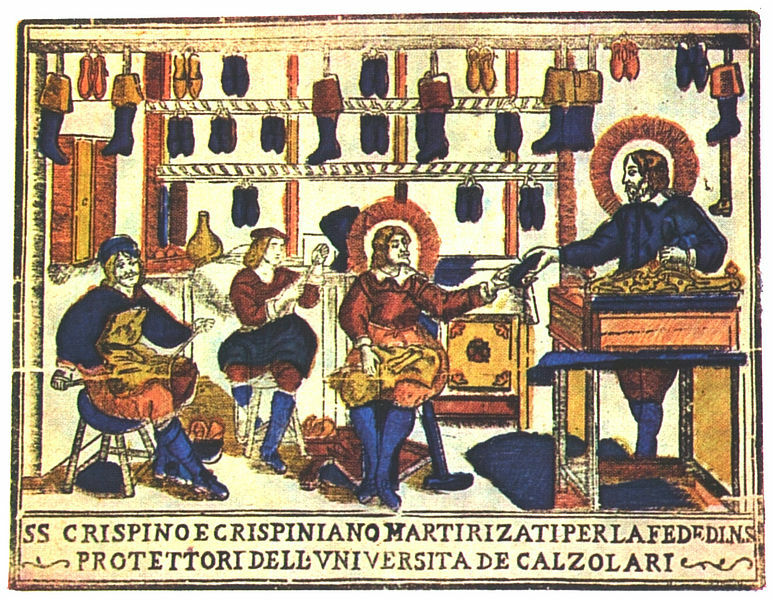 Crispin and Crispinian are the patron saints of shoemakers, saddlers, and tanners. Their feast falls on 25 October. Acta SS., Oct., XI, 495-540; BARING-GOULD, Lives of the Saints, XII, 628; BUTLER, Lives of the Saints. 25 October; Bio-Bibl. 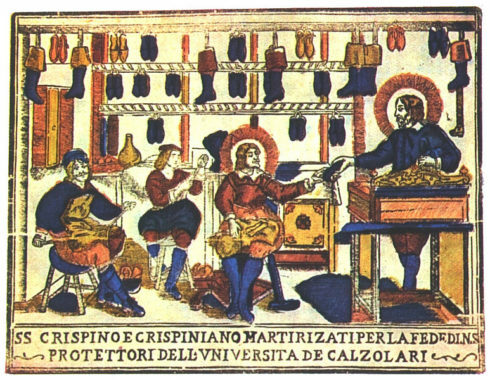 s. v.
Saints Crispin and Crispinian are the patrons and models of the pious confraternity of brother shoemakers, an establishment begun by Henry Michael Buch, commonly called Good Henry. His parents were poor day-labourers at Erlon, in the duchy of Luxemburg. Henry was distinguished from his infancy for his parts and extraordinary piety and prudence. He was put apprentice very young to a shoemaker. With the duties of his calling he joined constant devotion and the exercise of all virtues. Sundays and holidays he spent chiefly in the churches, was a great lover of holy prayer, and studied earnestly to know and contemn himself, to mortify his senses and to deny his own will. He took SS. 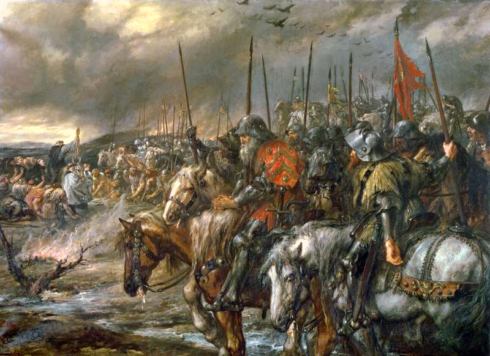 Crispin and Crispinian for his models, and, at his work, had them before his eyes, considering often how they worked with a view purely to please God, and to have an opportunity to convert infidels, and to relieve the poor. It was to him a subject of grief to see many in the same or the like trades ill instructed, slothful in the practice of virtue, and engaged in dangerous or criminal habits; and, by his zealous and prudent exhortations and endeavours, he induced many such to assist diligently at catechism and pious instructions, to shun ale-houses and dangerous company, to frequent the sacraments, to pray devoutly; especially to make every evening acts of faith, hope, divine love, and contrition, and to love only virtuous company, and whatever promoted piety and religion. In this manner, he laid himself out with great zeal and success, when, the term of his apprenticeship being expired, he worked as journeyman; and God so abundantly diffused in his heart his holy spirit and charity, and gave such authority and weight to his words, by the character of his sanctity, that he seemed to have established him the father of his family, to hear the complaints, reconcile the differences, inquire into the distresses, comfort the sorrows, and even relieve the wants of many. The servant of God went always very meanly clad, yet often gave to the poor some of the clothes off his back; he retrenched everything that was superfluous, and often contented himself with bread and water that he might feed the hungry, and clothe the naked. Thus he had lived at his work several years at Luxemburg and Messen, when providence conducted him to Paris, where he continued the same zealous life among the young men of his low rank and profession. He was forty-five years old when the Baron of Renty, whose piety has rendered his name famous, having heard him spoken of, was extremely desirous to see him. The simplicity and most edifying and enlightened discourse of the poor shoemaker surprised and charmed the good baron, who discovered in him an extraordinary prudence and penetration in spiritual things, and an invincible courage to undertake and execute great projects for the honour of God. He was informed that Henry reformed many dissolute apprentices and children, and, with great address and piety, reconciled to them their angry masters or parents; that he prescribed to many that were so disposed, excellent rules of a pious life: and that he had an excellent talent at instructing and exhorting poor strangers who had no friends, and seemed destitute of comfort, in the hospital of St. Gervaise, which he visited every day. But what gave him the highest idea of Henry’s sanctity, was the eminent spirit of prayer and humility, and the supernatural graces with which he discovered him to be endowed. Frères Cordonniers, which was established for shoemakers and tailors, by the Baron de Renty & Henry Michael Buch. 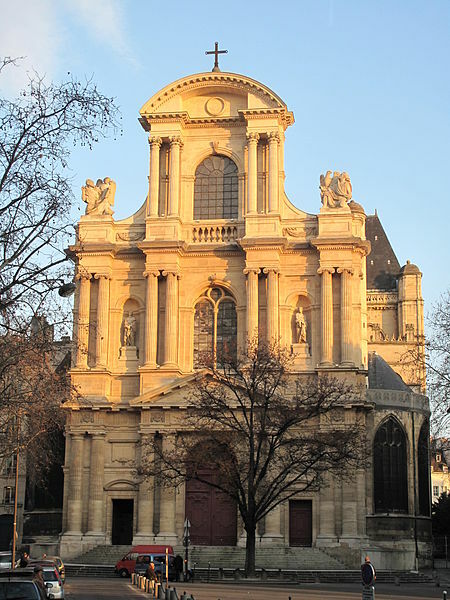 Facade of the church Saint-Gervais_Saint-Protais in Paris. 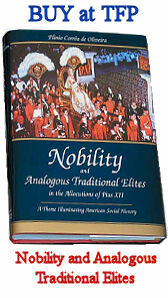 An enterprise which the pious Baron of Renty had extremely at heart, was to engage persons in the world, of all professions, especially artisans and the poor, to instruct themselves in, and faithfully to practise, all the means of Christian perfection, of which his own life was a model. 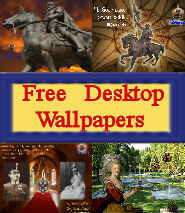 Gaston John Baptist, baron of Renty, son of Charles, baron of Renty, of an ancient noble family of Artois, was born at the castle of Beni, in the diocess of Bayeux in Normandy, in 1611. 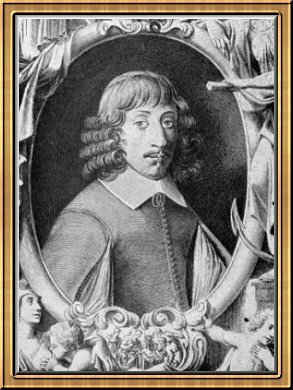 He was placed very young in the college of Navarre at Paris, and afterwards in the college of the Jesuits at Caën with a clergyman for his preceptor, and a secular governor: at seventeen, he was sent to the academy at Paris, and gained great reputation by his progress in learning, and his address in all his exercises, especially riding and fencing. Piety from the cradle was his favourite inclination, which was much strengthened by his reading the Imitation of Christ. His desire of becoming a Carthusian was overruled by his parents; and, in the twenty-second year of his age, he married Elizabeth of Balzac, of the family of Entragues, daughter to the Count of Graville, by whom he left two sons and two daughters. 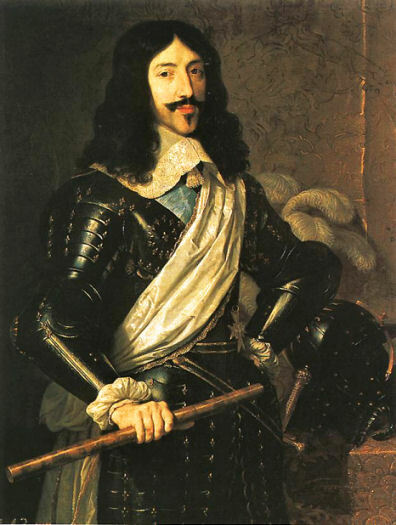 His great abilities, modesty, and prudence rendered him conspicuous in the world, especially in the states at Rouen, wherein he assisted as deputy of the nobility of the Bailiwick of Vire, and in the army, in which he served in Lorrain, being captain of a select company of six-score men, of whom sixty were gentlemen of good families. His valour, watchful and tender care of all under his charge, regular and fervent devotion, attention to every duty, excessive charity, humility, penance, and the exercise of all virtues cannot be recounted in this place. He was much esteemed by King Lewis XIII; but it was his greatest happiness, that in the midst of the world his heart appeared as perfectly disengaged from it, and raised above it as the Pauls, Antonies, and Arseniuses were in their deserts. 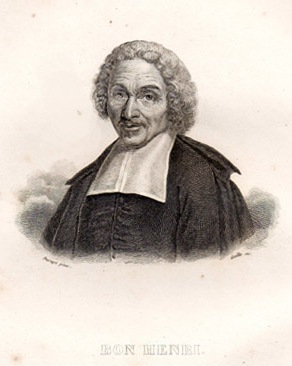 In the twenty-seventh year of his age, the sermons of a certain Oratorian who preached a mission, about seven leagues from Paris, made so strong an impression upon his soul, that after making a general confession to that pious priest, by his advice, he entered upon a new course of life, resolving to break all his connexions with the court, resign all public business, and lay aside superfluous visits that he might give his whole heart to God in prayer, and to works of duty and charity. He chose for his director F. Condren, general of the Oratorians, a most holy and experienced master in an interior life, as his pious writings and the history of his life show. As the whole secret of a Christian consists in destroying what is vicious in our affections that grace may reign in us, and in making the old man die that Christ alone may live in our hearts, the baron, by the counsels of his director, redoubled his application to subdue his passions, and regulate all the interior and exterior motions of his heart and senses. By vigorously thwarting the inclinations of nature and the senses, he brought them into subjection; and wherever he discovered any symptom of the least irregularity, he strongly counteracted the inclination, by doing the contrary. He made every day two examinations of conscience, at noon and at night; went to confession twice, and to communion three or four times a week: rose at midnight to say matins with an hour’s meditation; had regular hours in the day for meditation, mass, and other devotions, and all family duties. His fasts and abstinence were most rigorous and continual; his clothes plain; the interior peace and serenity of his mind demonstrated the submission of his passions to reason and the divine will, and that he very little desired or feared anything temporal, considering God alone, whether in prosperity or adversity. His retrenchment of every superfluity showed his love of poverty. He looked upon himself as the most unworthy and the basest of all creatures; in his letters took the title of sinner, or the most grievous sinner, and lived in a total annihilation of himself before God and all creatures; when he spoke of God, he humbled himself to the very centre of the earth, and he would feelingly say, that so base a creature ought with trembling to adore God in silence, without presuming to pronounce his name. In a sincere love for a hidden and unknown life he shunned and dreaded esteem and honour, insomuch that it would have been a pleasure to him to be banished from all hearts, and forgotten by all men. He earnestly conjured his devout friends to sigh to God for him, that the spirit of his divine Son might be his life, or that he might live in him and for him alone. It was his custom to consecrate frequently to God, in the most solemn manner, his whole being, his body, soul, wife, children, estate, and whatever could concern him, earnestly praying that with the utmost purity, simplicity, and innocency he might do all things purely for God, without the least secret spark of self-love, and without feeling joy or sorrow, or any other sentiment which he did not totally refer to Him. His devotion to the blessed sacrament was such, that he usually spent several hours in the day on his knees before it; and when others wondered he could abide so long together on his knees, he said it was this that gave him vigour and strength, and revived his soul. He often served at mass himself: he rebuilt the church at Beni; and out of devotion to the holy sacrament, he furnished a great number of poor parish-churches with neat silver chalices and ciboriums. It would be too long here to mention his care of his family, and of all his tenants, but especially of his children; frequent attendance upon the sick in hospitals, and in their cottages, and his incredible and perpetual charities not only among his own vassals and in neighbouring places, but also among the distant hospitals, the slaves at Marseilles, the Christian slaves in Barbary, the missions in the Indies, several English and Irish Catholic exiles, &c. After the death of P. Condren, he chose for his director a devout father of the Society of Jesus, and, for some time before his death, communicated usually every day. Prayer being the great channel through which the divine gifts are chiefly communicated to our souls, in imitation of all the saints he made this his ordinary employment, and his whole life might be called a continued prayer. His eminent spirit of prayer was founded in the most profound humility, and constant mortification. The soul must die before she can live by the true life; she must be crucified to herself and the world before she is capable of uniting herself intimately to God, in which consists her perfection. This faithful servant of God was dead to the love of riches and the goods of the world; to its amusements, pleasures, and honours; to the esteem and applause of men, and also to their contempt; to the inordinate affections or inclinations of self-love, so that his heart seemed to be withheld by no ties, but totally possessed by God and his pure love. In these dispositions he was prepared for the company of the heavenly spirits. The latter years of his life he spent partly at Paris, and partly at his country seat or castle at his manor of Citri, in the diocess of Soissons. It was at Paris that he fell ill of his last sickness, in which he suffered great pains without giving the least sign of complaint. Having most devoutly received all the sacraments he calmly expired on the 24th of April, in the year 1649, of his age the thirty-seventh. He was buried at Citri; his body was taken up on the 15th of September, in 1658, by an order of the bishop, to be removed to a more honourable place; and was found as fresh and entire as if he had been but just dead. 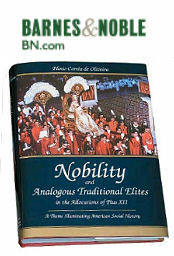 See his life by F. St. Jure, a Jesuit of singular piety and learning. The Lives of the Saints. 1866, pp 286-288. Old men forget. Yet all shall be forgot. but we in it shall be remember’d. shall be my brother. Be he ne’er so vile. who fought with us upon Saint Crispin’s day. 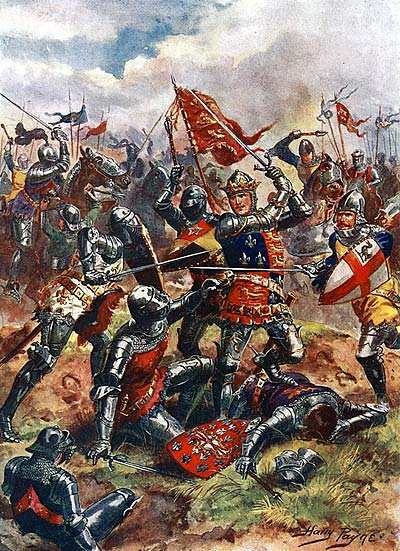 Morning of the Battle of Agincourt, October 25, 1415. So, once more unto the breach, dear friends, once more. Stiffen the sinews. Summon up the blood. Disguise fair nature with hard-favour’d rage. like the brass cannon. Let the brow o’erwhelm it. Now set the teeth and stretch the nostril wide. show us here the mettle of your pasture. Show us here that you are worth your breeding, which I doubt not. straining upon the start. The game’s afoot.